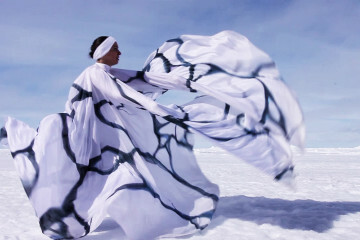 Chelsea Clarke delicately adds a core to the creation. A jumble of ruined columns rise a foot or so from the thick snow cover. It looks partly like a complex network of bridges, partly like the decaying ruins of an ancient ice culture – a culture albeit with a sense of humor. 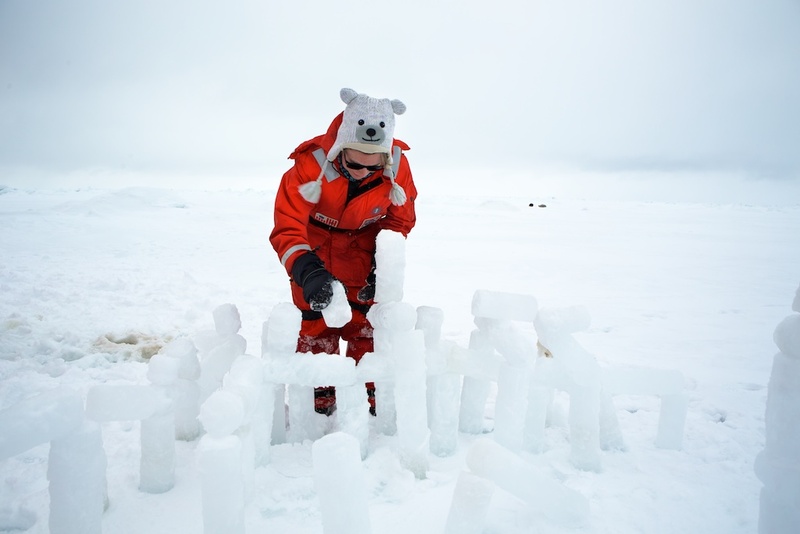 The group milling around this installation quickly and enthusiastically introduce their work to me – this is “Ice Henge”, the product of excess ice core samples and fertile imaginations in the science party. The team are drilling and extracting 9 cm round ice cores from top to bottom. 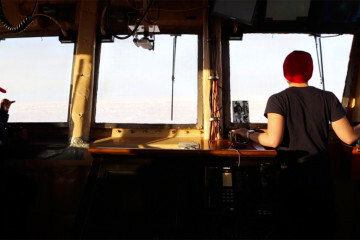 They take the cores back onto the ship to study the biology in the ice. The ice is actually porous, riddled with a complex network of thin brine channels that microscopic ice algae use as their home. Here, they have ready access to both the things they need to grow: they are sandwiched in between the light coming in from above and the nutrients percolating up from the ocean below. 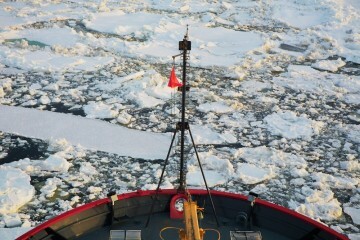 The team have seen ice-algae everywhere they’ve been in the Chukchi Sea on this expedition so far. They are a vital food source for many animals in the Arctic at this time of the year, the period before the larger oceanic phytoplankton blooms occur after the ice starts to melt. The team are investigating how healthy the algae is, what types of algae are growing, how fast they are spreading through the ice and what dictates all of these factors. They take the cores on to the boat and conduct experiments on the algae to answer these questions. Often, the algae are concentrated right at the bottom of the ice, staining the underside brown. At these times, the team are only really interested in sampling the bottom 10 cm of a core. The rest, up to 5 foot, is scrapped. And what better way to deal with the trip hazard of 30 or more rejected cores hidden under the snow than turn them into a sprawling ice sculpture? 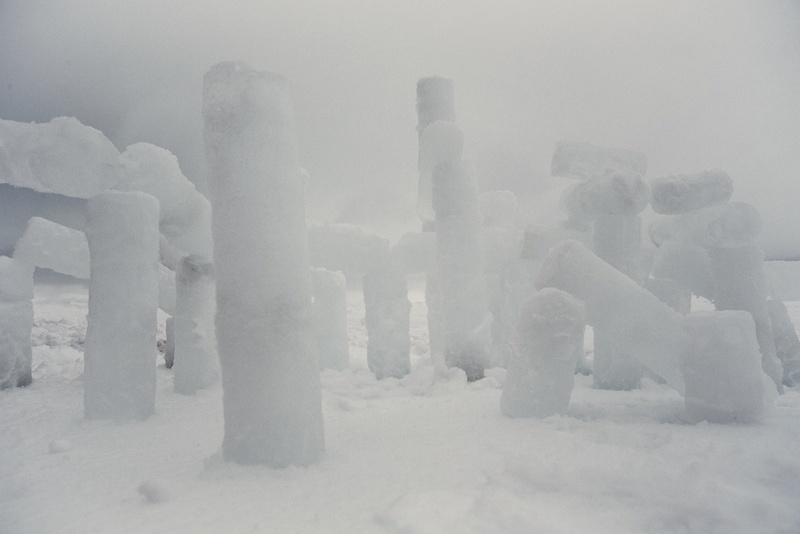 Ice Henge “towering” above the matted snow.